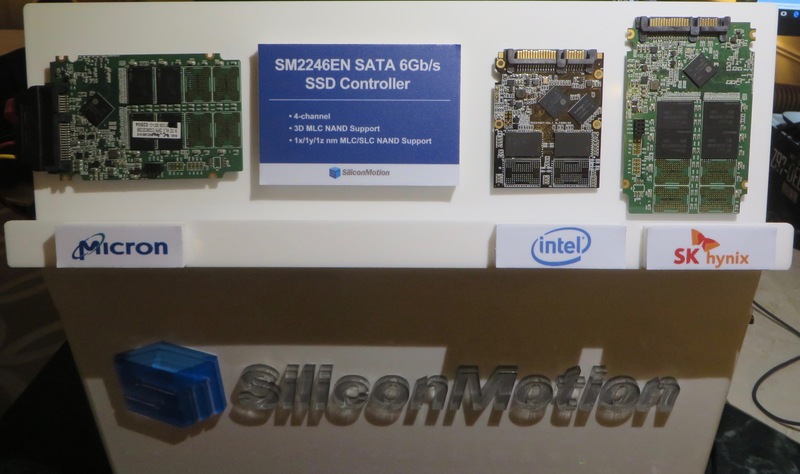 2015 was a great year for SSD controller designer Silicon Motion. Their SM2246EN controller was at the heart of some of the best mainstream and value SATA SSDs, while their DRAM-less SM2246XT and their TLC-compatible SM2256 each had several design wins for even more affordable SSDs. At CES, Silicon Motion showed off their full range of products and shared some of their plans to stay competitive through 2016. The most important development for the SSD market in 2016 will almost certainly be the availability of 3D NAND from companies other than Samsung (who's been shipping 3D NAND since 2014 and will be rolling out their third generation of it this year). 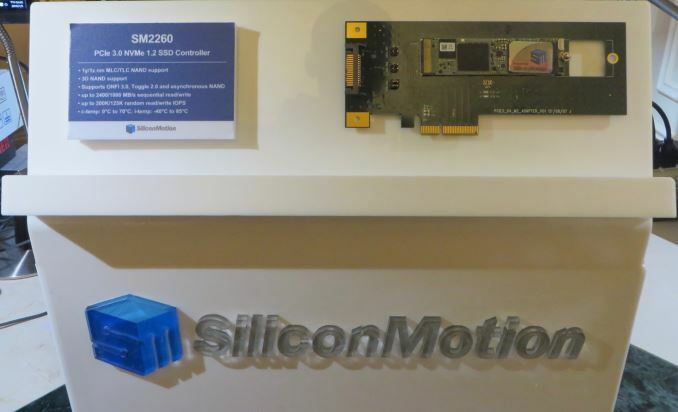 Silicon Motion has updated their firmware for the SM2246EN controller to support 3D MLC NAND, and they showed off drives using 3D NAND flash sourced from Intel, Micron, and Hynix. This demonstrates that Silicon Motion is ready for the transition to 3D NAND and that we can expect drives to be hitting the shelves as soon as the flash itself is available in bulk on the open market. It's also nice to have independent confirmation that both IMFT and Hynix are on track with their 3D NAND development. Conspicuously absent from the lineup was 3D NAND from the Toshiba and SanDisk joint venture. We already expected them to be last to ship 3D NAND due to their fab for it not being scheduled to begin mass production until this year, so it's no surprise if they're keeping things under wraps for a little longer. To support 3D TLC NAND, Silicon Motion will be releasing a SM2258 controller as the successor to SM2256, but this new controller was not on display and we don't have information on what other changes it may bring to the table. SM2258 should be ready by the middle of the year, so it shouldn't be too long before we have more details. The last big update concerns the SM2260 PCIe SSD controller. A launch date hasn't been announced, but we were told to expect a more interesting demo at Flash Memory Summit, suggesting it will be ready to ship in the second half of 2016. The expected performance specifications have changed slightly from what we last heard in June 2015: sequential read speed is up from 2200 MB/s to 2400 MB/s while sequential write is down from 1100 MB/s to 1000 MB/s. Random read and write ratings remain at 200K and 125K IOPS respectively. With the exception of random write those numbers are a bit below what Samsung advertises for the 950 Pro, but close enough that SM2260-based drives can probably be competitive by just undercutting Samsung's pricing by a little bit. 3D NAND support has also been added to the feature list, and NVMe version 1.2 will be supported. To make use of the higher speeds of the PCIe 3.0 x4 interface, the SM2260 uses a dual-core ARM processor instead of the single-core ARC processor used by Silicon Motion's SATA SSD controllers and the SM2260 has 8 NAND interface channels compared to 4 channels for SM2246EN and SM2256. Silicon Motion still has no direct successor planned for the DRAM-less SM2246XT controller but they confirmed that all of their controllers could be used in a DRAM-less configuration with appropriate firmware, so a DRAM-less TLC SSD could be built using SM2256 if somebody thought the cost savings were worth the firmware development efforts. Silicon Motion was also showing off their current lineup of solutions for USB flash drives including Type-C and Lightning port support, as well as their eMMC and single-package SSD products intended mainly for industrial, automotive and other embedded applications. Sandisk reported Q4 and if you look at the prepared remarks pdf there are some very interesting bits. 3D NAND expected to achieve lower cost versus 2D NAND in 2017. " - they claim that 15nm has the best yields they ever had on any process. "we expect 3D NAND to represent about 15% to 20% of industry wafer capacity exiting the year. We expect our 3D capacity to be at the lower end of the industry range exiting 2016"